The EFF's US$250,000 DES cracking machine contained over 1,800 custom chips and could brute-force a DES key in a matter of days. 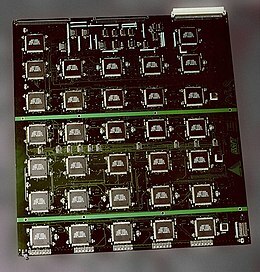 The photograph shows a DES Cracker circuit board fitted on both sides with 64 Deep Crack chips. ↑ Paar 2010, p. 7.